Good news on the heels of this week's NCJ cover story: Governor Jerry Brown has signed Senate Bill 81, renewing this year's funding for the Home to School Transportation Program. As Sean J. Kearns's story makes clear, plenty of hurdles loom ahead. But for now, residents of the county's more rural regions are breathing a sigh of relief. Praising the Governor for his swift action and understanding of an issue of critical importance to rural California school children, Assemblymember Wesley Chesbro (D-North Coast) today thanked Jerry Brown for signing SB 81, the bill that restores this year's funding for the Home to School Transportation program. The signing came in time to save districts on the brink of firing their school bus drivers. "I am thrilled that the Legislature and Governor were able to come together to restore the funding that gets California's students to school," Chesbro said. "Home-to-School Transportation is an essential service in my district. 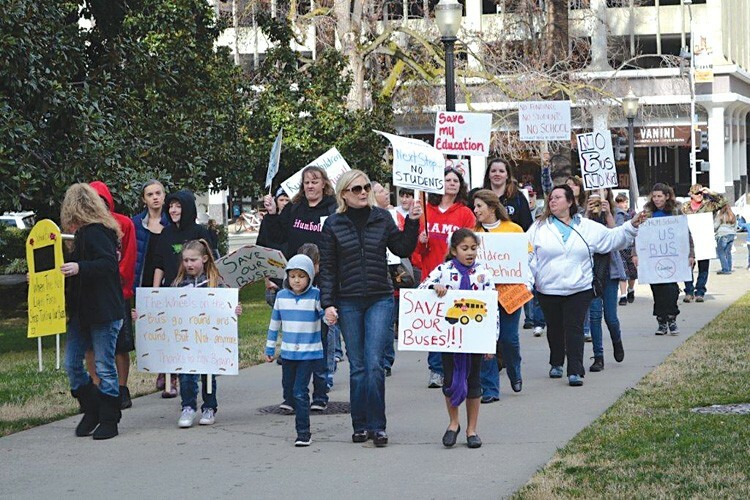 This bill was signed just in time to save the jobs of many school bus drivers and ensure that there is no interruption in getting kids to school." SB 81 replaces the $248 million cut to the Home-to-School Transportation program made by Governor Brown, with a smaller, more equitable reduction across all school districts in California. SB 81 moved quickly through the Legislature and made it to the Governor's desk in just three days. As a budget bill, SB 81 will go into effect immediately.